Insanity the Ride is a truly mind-bending experience! A massive mechanical arm extending out 64 feet over the edge of the Stratosphere Tower at a height of over 900 feet, this Vegas ride will spin you and several other passengers in the open air at speeds of up to three 'G's. You'll be propelled up to an angle of 70 degrees, which will tilt your body into one position ? straight down! If you're brave enough to keep your eyes open, you'll be rewarded with a breathtaking view of historic downtown Las Vegas. Experience Insanity and walk away to tell the tale! Ever played on a giant teeter-totter, 866 feet above the ground? With X-Scream, you can! It's space age, yet simplistic design resembles a massive teeter-totter or a Vegas rollercoaster unlike any other ever seen. 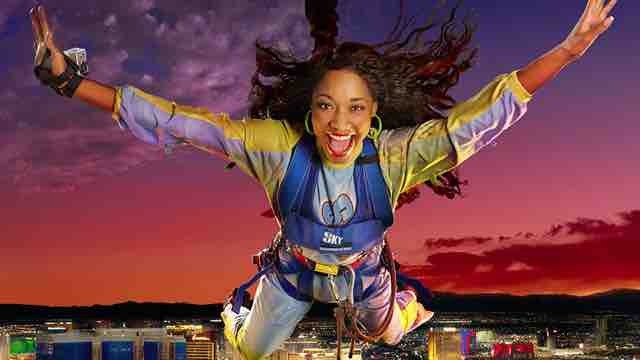 X-Scream propels you and several other riders headfirst, 27 feet over the edge of the Stratosphere Casino, Hotel & Tower. Try not to scream when you go over the edge ? you don't want to scare the other riders! After being shot over the edge, you'll dangle weightlessly above the Las Vegas Strip before being pulled back and propelled over again for more.